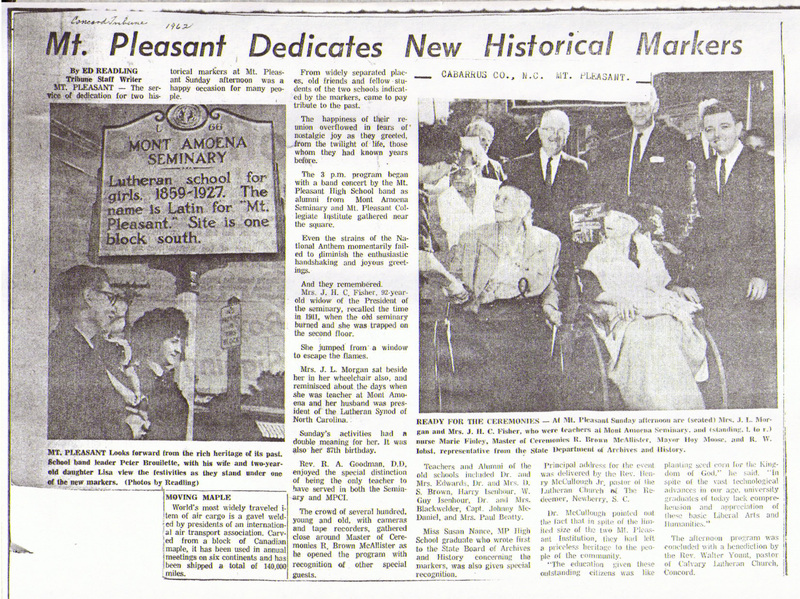 A newspaper article from the Concord Tribune, 1962 about the dedication of Mont Ameona Seminary historical marker. MT. PLEASANT – The service of dedication for two historical markers at Mt. Pleasant Sunday afternoon was a happy occasion for many people. From widely separated places, old friends and fellow students of the two schools indicated by the markers, came to pay tribute to the past. The happiness of their reunion overflowed in the tears of nostalgic joy as they greeted, from the twilight of life, those whom they had known years before. The 3 p.m. program began with a band concert by the Mt. Pleasant High School band as alumni from Mont Amoena Seminary and Mt. Pleasant Collegiate Institute gathered near the square. Even the strains of the National Anthem momentarily failed to diminish the enthusiastic handshaking and joyous greetings. Mrs. J. H. C. Fisher, 92-year-old widow of the President of the seminary, recalled the time in 1911, when the old seminary burned and she was trapped on the second floor. She jumped from a window to escape the flames. Mrs. J. L. Morgan sat beside her in hThe crowd of several hundred, er wheelchair also, and reminisced about the days when she was teacher at Mont Amoena and her husband was president of the Lutheran Synod of North Carolina. Sunday’s activities had a double meaning for her. It was also her 87th birthday. Rev. R. A. Goodman, D. D. enjoyed the special distinction of being the only teacher to have served in both the Seminary and MPCI. The crowd of several hundred, young and old, with cameras and tape recorders, gathered close around Master of Ceremonies R. Brown McAllister as he opened the program with recognition of other special guests. Teachers and Alumni of the old schools included Dr. and Mrs. Edwards, Dr. and Mrs. D. S. Brown, Harry Isenhour, W. Guy Isenhour, Dr. and Mrs. Blackwelder, Capt. Johnny McDaniel, and Mrs. Paul Beatty. Miss Susan Nance, MP High School graduate who wrote first to the Sate Board of Archives and History concerning the markers, was also given special recognition. Principal address for the event was delivered by the Rev. Henry McCullough Jr. pastor of the Lutheran Church of The Redeemer, Newberry, S. C.
Dr. McCullough pointed out the fact that in spite of the limited size of the two Mt. Pleasant Institution, they had left a priceless heritage to the people of the community. The afternoon program was concluded with a benediciton by the Rev. Walter yount, pastor of Calvary Lutheran Church, Concord. This entry was posted in 1960s, Cultural History, Newspaper Article and tagged 1960s, Cultural History, Newspaper Article. Bookmark the permalink.